The Naked and Famous may not be naked, but I'd be damned not to say that they're now famous. New Zealand’s own The Naked and Famous are responsible for easily one of the most invigorating albums of 2011; Passive Me, Aggressive You. From start to finish this album is a self-sufficient youthful journey of loud and powerful indie rock that ranges from the synth strung Young Blood to the heavy distorted guitars found on Frayed and many other tracks. The overall listening experience is definitely a memorable one that does not allow itself to be taken for granted. The Naked and Famous bring a unique form of vitality to a genre that likes to say it’s seen it all. The reception from critics and audiences alike could generally not be more positive making this band one of the most demanded acts of 2011. The alarm has sounded and what has commenced must be allowed to finish and take its course. Frayed is just something that can’t be fought off with its alluring build up into a full blown tantalizer of the musical senses. Ok, so maybe I get a bit more out of this track then the average individual but there is no denying the mesmerizing appeal of this wicked track. Ah, Young Blood. The pinnacle song in The Naked and Famous’ arsenal, and what I like to believe is the track that put these guys on the map. From the second those first synth driven notes are dropped you find yourself enveloped in a song that just towers above the rest of what 2011 has to offer. This is something new- something different- you could almost say it’s a breed of its own. This track is the very embodiment of the youthfulness and spontaneity The Naked and Famous evoke so well. I don’t think Passive Me, Aggressive You would have been the same with out this beautiful stand out of a track. Categories: Top 10 Albums of 2011! 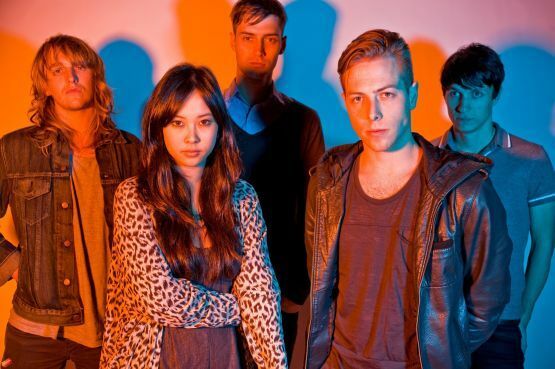 | Tags: Best of 2011, Frayed, Indie Rock, New Zealand, Passive Me Aggressive You, The Naked and Famous, Top 10 Albums of 2011, Young Blood | Permalink.